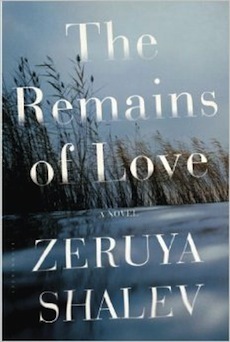 In The Remains of Love, her latest novel to be translated into English, Zeruya Shalev once again explores (and crosses) intimate emotional boundaries. In this novel, however, she also overtly explores territory that she has actively resisted – Israel, where she was born and still lives. Shalev included a winking emoticon after this last comment, indicating that the remark should be taken with a grain of salt, or at least not as seriously as it reads. She has an engaging manner and a sense of humor, which comes through in her writing (amid the serious, emotional and provocative material) and especially in interviews (there are several available on YouTube). In addition to her talent as a writer – her novels are critically acclaimed and have garnered various awards – Shalev is a thoughtful, friendly and relaxed interviewee. She is a great choice to launch this year’s Cherie Smith JCCGV Jewish Book Festival on Nov. 22. The Remains of Love (Bloomsbury, 2013) centres around a dying woman, Hemda Horovitz, and her two adult children, who each have families, foibles and problems of their own. Her favorite, Avner, is a human rights lawyer; he is questioning everything about his life, whether he has made a dent in the inequality and injustice in the world, as well as his relationship with his wife and sons. Hemda’s daughter, Dina, has devoted herself to her own daughter, Nitzan – giving her the love she never received from Hemda – but, like most teenagers, Nitzan is pulling away, so Dina looks to adopting a child to fill the void, even though her husband and daughter are against it. The focus on three protagonists required a change in style for Shalev. Shalev’s Vancouver visit is part of a tour that begins in Houston and which also stops in Detroit, New York and Chicago. Hopefully, she also likes rain. The Sol & Shirley Kort Author Series will feature Zeruya Shalev in conversation with the Globe’s Marsha Lederman on Nov. 22, 7:30 p.m., in the Rothstein Theatre. Tickets ($20) are available from ticketpeak.com/jccgv or the Jewish Community Centre of Greater Vancouver, in person or by calling 604-257-5111. For the full Cherie Smith JCCGV Jewish Book Festival lineup, visit jewishbookfestival.ca.